Ring and Annabelle are a bonded pair. They are both house trained. Annabelle is definitely the boss of the two! She is sassy but also a lover! She loves to be picked up and held like a baby. She loves to play with toys. Ringo is a good brother, he just goes with the flow, he is a sweetheart! They both are! They love walks and rides in the car. They get worried when I go to another place in the house and they can’t follow me. I keep them gated in my family room, kitchen and sunroom. 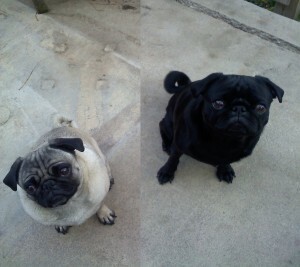 They are used to being home all day with another pug and are so excited to see me when I get home! They are great nappers and Ringo has the best snore ever! They play with the neighbor children and get very excited when they come over! They will make a great addition to any family. Ringo and Annabelle are Adopted!